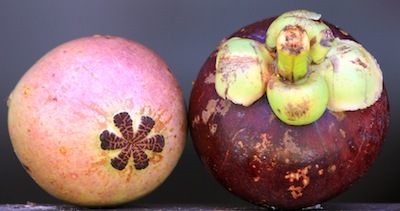 Mangosteen fruit can vary in size from 4 – 7cm in diameter, and are equally delicious regardless of size. The bigger fruit may have a seed in the larger segments and the number of segments in a fruit is directly related to the number of petals on the bottom of the rind. When the skin is a rich red purple colour the fruit inside is ready to eat. The deep purple fruit are the sweetest, while fruit with a lighter skin colour are slightly more acidic. A green fruit will only ripen if it has a maroon blush of colour. It they are bluish black or the skin is hard the fruit is over-ripe. Skin imperfections are not an indication of the quality of the fruit.